April 28, 1923. Washington, D.C. "McGrew of Nationals, Harriss of Athletics." Two tall pitchers -- Washington's Slim McGrew goes up against Philadelphia's Slim Harriss. National Photo Company Collection glass negative. View full size. Submitted by ghostofwadelefler on Mon, 07/11/2011 - 7:02pm. The '23 Nats finished 75-78 under Donie Bush, still good enough for fourth place behind the juggernaut Yankees. Second baseman Bucky Harris would take over as player-manager the following season. 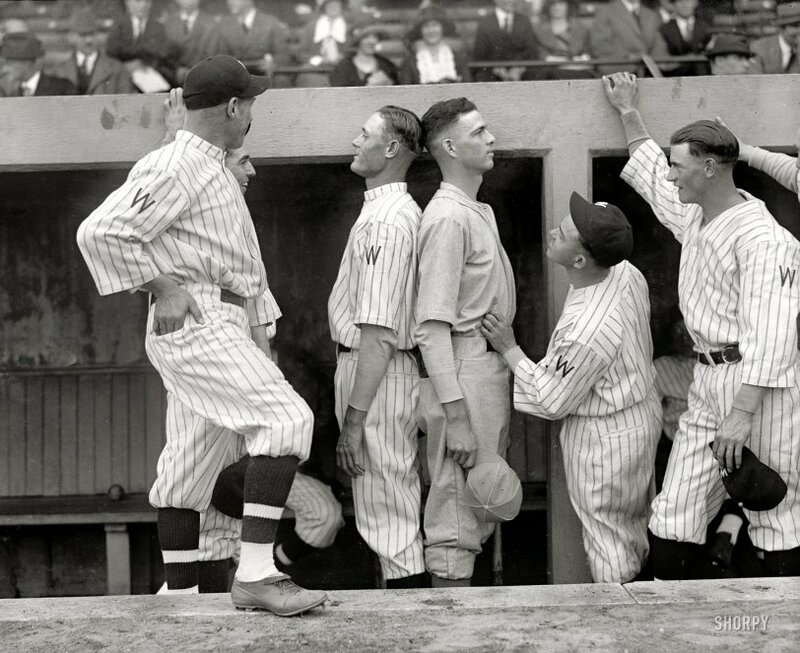 Fielding essentially the same starting lineup but with an improved bench, the Harris-led Nationals would win the 1924 AL pennant and go on to win the World Series in 7 games over the Giants - still the only baseball world championship in Washington to date. Submitted by Mark Dyer on Mon, 07/11/2011 - 6:25am. According to baseball-reference.com, Slim McGrew was 6'7" and 235. He couldn't have been that slim. It also says that Slim Harriss was 6'6". From the picture it would seem that Harriss was the taller man however. Submitted by gulfcoastgal on Sat, 07/09/2011 - 10:04pm. No dancing involved. Love the pic! Submitted by jimmylee42 on Sun, 07/10/2011 - 2:48pm. This pic reminds me of the first of the very tall pitchers in the major leagues. Ewell Blackwell was 6 ft 6 and played for Cincinnati in the late 40's and early 50's. His best season was 1947 with 22 wins and only 7 losses. He came very close to pitching two consecutive no hitters once but Eddie Stankey broke it up in the ninth inning with a hit. After commenting above paragraph I read in the paper where the AA Arkansas Traveler ball club has a pitcher that is 7 ft 1. Not only is he the tallest pitcher, but he is the tallest professional baseball player to ever play the game of baseball. His name is Loek Van Mil and he is signed with the Los Angeles Angels. Submitted by Railsplitter on Sat, 07/09/2011 - 5:11pm. Submitted by Vintagetvs on Sat, 07/09/2011 - 4:14pm. Groom & Clean leaves your hair looking soft and natural, the other brand leaves it wet & greasy looking.